Twitter for Business is a 20-page guide written by small business marketing expert, John Jantsch who runs Duct Tape Marketing. 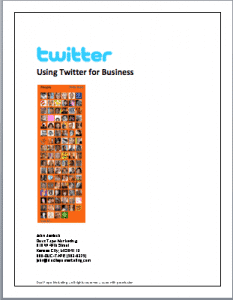 The booklet covers the basics of Twitter and shows exactly how John uses it for his business, providing a valuable insight into expert usage. In this report you will find out how you can follow the right people, how to mine Twitter for leads, what “hashtags” mean and how you can manage your daily Twitter activity. There are dozens of tips in this booklet as well as a variety of links to useful web sites and services to help you improve your use of Twitter. His booklet helps anyone in small business – and the ultra connected techie – to get the most out of Twitter. Thanks to John for allowing this site to include this useful publication.